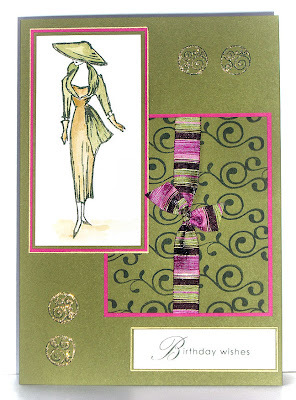 I found the most gorgeous ribbon it is so rich and scrumptious that I had to set to and make a card straight away with it, it was so expensive I tried to figure a way of using a little but still showing it off. The stamp I used for the lady is a clarity Stamp and one of my favorites I stamped it with Archival ink the painted it with watercolours. The accent stamps and the sentiment were stamped with Papertrey ink stamps. That ribbon is GORGEOUS! AND i love the card.